Rich and Max have more to say about fall camp. And the sound is a little touch and go at times. Sorry peeps. Posted in 2018 Season and tagged with Deron Harrell, Kayden Lyles, Jack Coan. August 7, 2018 by Buckaround. Listener favorite Mike'l Severe returns to preview Nebraska plus Rich and Max talk roster news, Media Days, and debate the best linebacker of the last 30 years. 3:00 What went wrong with Riley? 4:15 What changes with the hiring of Frost? 6:30 Why all the roster turnover? 11:15 How does 2018 play out? Posted in 2018 Season, B1G Picture and tagged with Mike'l Severe, T.J. Edwards, Kare Lyles, Bret Connors, Sam Brodner. July 25, 2018 by Buckaround. 1:00 A less verbose intro... or is it? 3:15 Were expectations in 2017 fair? 6:00 What will the offense look like and what are the names to know? 9:45 Is the defense gonna be really solid? Better than last year? 13:30 Big Ten East Champs or bust!!! 15:45 Is this season all about beating OSU? Posted in 2018 Season, B1G Picture and tagged with Kyle Rowland, Bret Bielema. July 18, 2018 by Buckaround. 25:30 Who’s gonna catch passes... and how many? Posted in 2018 Season and tagged with Milwaukee, Quintez Cephus, Danny Davis, Kyle Penniston, D'Cota Dixon. July 10, 2018 by Buckaround. Scott Dochterman previews the Iowa Hawkeyes plus Rich and Max talk about the potential for Kayden Lyles' to move to nose guard and the relative strength of Iowa and Wisconsin as football programs. 15:00 Will the defense be able to replace the LB’s? Posted in 2018 Season, B1G Picture and tagged with Iowa Hawkeyes, Scott Dochterman, Kayden Lyles, Milwaukee. June 26, 2018 by Buckaround. Rich and Max preview Rutgers with James Kratch before discussing how the Badgers might manage the injuries to Rand and Loudermilk, what "shutting down your recruitment" really means and work through some listener mail. 14:45 Will the defense still be a strength? 18:00 Does Ash have to make a bowl in 18? 33:45 Does Mertz shutting it down mean anything? Posted in 2018 Season, B1G Picture and tagged with Rutgers Scarlet Knights, James Kratch, Garret Rand, Isaiahh Loudermilk, Graham Mertz, Milwaukee. June 18, 2018 by Buckaround. Rich discusses Northwestern with Adam Hoge before he's joined by Max to break down the impact of the injuries to Garret Rand and Isaiah Loudermilk for 2018. 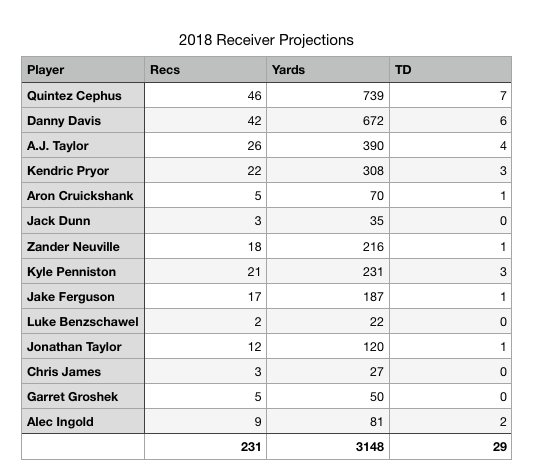 9:30 Who else is of note for the 2018 offense? 14:15 Will the defense be as good as last year? 55:30 Shirts, hoodies AND hats! Posted in 2018 Season, B1G Picture and tagged with Northwestern Wildcats, Adam Hoge, Isaiahh Loudermilk, Garret Rand, Milwaukee. June 12, 2018 by Buckaround. Kyle Goblirsch previews the Gophers and Rich and Max discuss the assistant coach pay raises and work through some listener mail regarding Jim Leonhard and the defensive side of the ball. 3:30 Was the plan evident to see in 2017? 6:00 Is the talent improving? 15:45 Looking for a transfer QB? Posted in 2018 Season, B1G Picture and tagged with Minnesota Gophers, Kyle Goblirsch. June 7, 2018 by Buckaround. Mike Carmin previews the Boilermakers in Jeff Brohm's 2nd year plus Rich and Max dissect the national title talk in the media of late. 3:15 Was last year's defensive success a surprise? 5:45 How much hype surrounds the 2018 season? 13:00 How good is the defense going to be this year and who to watch? Posted in 2018 Season, B1G Picture and tagged with Purdue Boilermakers, Mike Carmin, National Championship. May 15, 2018 by Buckaround. Jeremy Werner previews Illinois plus Rich and Max discuss Ryan Connelly as an OLB, what consequences there are for canceling the spring game, and the transfer of Kare Lyles. 9:45 Who will step up on defense? 37:30 Shirts or hoodies... or a hat? Posted in 2018 Season and tagged with Kare Lyles, Ryan Connelly, Fighting Illini. May 7, 2018 by Buckaround. Jason Galloway joins the podcast to give his thoughts at the conclusion of spring practice. 10:30 Will Sam Brodner play as a #3 RB? 21:15 How does TE play out if Nueville isn't ready? Posted in 2018 Season and tagged with Aron Cruickshank, Madison Cone, Tyler Johnson, Zander Neuville. April 23, 2018 by Buckaround. Posted in 2018 Season and tagged with Spring Practice 2018, Aron Cruickshank, Sam Brodner. April 16, 2018 by Buckaround. Rich and Max take stock of a spring practice with minimal drama and little intrigue. How do you make this interesting? 24:30 Will there be a 50-50 run-pass play call this year? 35:00 Kyle's closing the doors. Go say hi!! Posted in 2018 Season and tagged with Spring Practice 2018, Taiwan Deal, Zach Baun, Arrington Farrar. March 26, 2018 by Buckaround. Rich and Max look at what can be learned about the Badgers as they head into another spring practice. Posted in 2018 Season and tagged with Paul Jackson, Kyle Penniston, Kraig Howe. March 13, 2018 by Buckaround. Rich and Max examine the future of the Badger defense. Posted in 2018 Season and tagged with Garret Rand, Arrington Farrar. February 28, 2018 by Buckaround. It's time to turn the page to 2018 as Rich and Max give their thoughts on what the offense will look like in 2018. 44:45 TE... a little bit of shakeup? February 22, 2018 by Buckaround.